After you work with us, you’ll find that clients feel more loyal and connected to your business. They rave about your employees and talk about the positive feelings they have for your business. You’ll get notes and calls with special comments and thanks for the “over and above” service they’ve received. Client loyalty is a function of personal emotional connection. That connection is a direct result of your employees’ behavior. When your employees are engaged, they produce for your clients. They show initiative and bring more of their talents to every task. These behaviors WOW your clients. Your company is expanding and all your employees are helping you. Your employees act like they belong to the same team. Your profits have grown from the increase in client loyalty. You think like a CEO of a bigger business. You prevent most “fires” by being a leader who has learned “fire prevention”. Your employees “own” their work. They want to help you achieve your vision and grow your company. Employees work well together, go after common goals, and communicate in a way that creates shared understanding. Projects go more smoothly. Your employees are engaged in the services they produce for your clients. They make good decisions on your behalf. Your company is growing, less constrained by employee issues. Sales and revenue are expanding, and you know you can count on your employees to deliver for you. You’ve mastered delegation, inspiring and developing your employees. Working with values and strategic objectives, you have less stress. The company’s systems are working smoothly with nothing slipping through the cracks. Your clients feel well taken care of. Employees have buy-in to make the business processes work and to fix them when they don’t -– without being asked. Once the systems and the procedures are set up, they’re self-generating. Everything is written down, so there are no gaps if someone leaves. Up-selling, cross-selling, and follow-up are happening like clockwork. 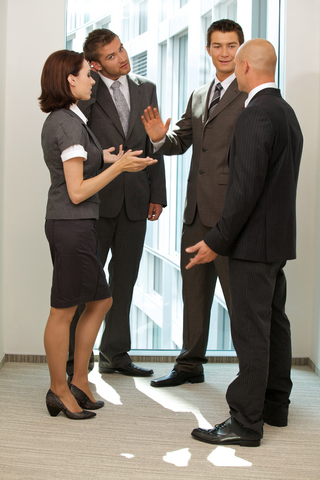 You’re getting referrals, and employees are asking for repeat business. Communication between the sales team and the fulfillment team is smooth and effective. You’re recruiting and hiring “A” players who fit your culture. Managers empower their people to be masters of their work. We coach and develop your managers. After training, your managers coach, inspire, and encourage productivity and efficiency. They know how to put the right people in the right spots. They hold employees accountable. They understand the company objectives that they are responsible for, and have plans in place to meet or exceed those objectives. Empowered employees drive a business forward. When employees are engaged and empowered, the natural result is productivity, caring and creativity. 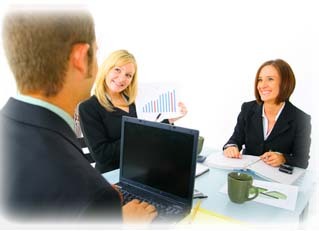 This creates a wonderful work environment, soaring profits and a win-win situation for owners, employees and clients. The way you treat your employees is reflected back in the way your employees treat your clients. When you care, treat employees with respect, and are interested in them as individuals, they respond by showing the same care and respect to your clients. Client loyalty is what provides long term sustained growth. Research states that a 5% increase in client loyalty adds 25-100% to the bottom line. The lifetime value of a client creates an “annuity” that drives profits up and costs down. A good leader is focused and targeted—as well as emotionally intelligent. You drive improved results by focusing on a destination, being efficient, following a plan, and monitoring numbers. You also need to inspire, connect, handle emotions, and participate in a “dance” with your employees and clients. Personal development creates change. If you want to change the organization, you must invest in changing the individuals. Individuals change not just by reading or hearing about change. They must “see” themselves differently, and then repeatedly act differently to form new habits. We listen more than we talk. You and your team have most of the answers. Our job is to ask the right questions that help you discover those answers. Then, we work with you to strategize, prioritize, own and implement what we uncover. We facilitate the environment and the process to bring out the best from every person. Then, we help you take this innate wisdom and coordinate it to create extraordinary outcomes. We focus on metrics. We consider team metrics and personal metrics very important for creating momentum, motivation and mastery. We clarify the business results that we’re measuring, and monitor their improvement. We surface and disseminate the most relevant and critical indicators that show the health of the business. By “watching the dial”, we know how we’re doing. We “stand for” each person’s best self in accomplishing professional goals. Sometimes, this means that we have to show you how you are shortchanging yourself or making excuses. When we see you thinking small, we bring you back to your bigger vision. If we believe “drama” is getting in your way, we support eliminating that obstacle. We are “there for you” as you step into a powerful future of leading others. Change may not be easy in your company, but we walk you through the rough spots. Often, breakdowns come before breakthroughs.There is likely to be resistance, anxiety and denial. We deal with that. We help you deal with that. It’s part of the process. Humans tend to resist change as we move from level to level. We prepare you and support your commitment to stay the course as you move through the unfamiliar. The New York area (and the rest of the world) is crowded with many excellent consultants and coaches. It’s important that you know what makes us different. You benefit from my 35 years’ experience—25 years at the helm of my own businesses. I come from a business-owner background, working with Information Technology, accountants, lawyers, ad agencies, non-profits, retail, restaurants, and manufacturing. For 18 years, I did IT consulting, prescribing infrastructure to owners. I worked “in the guts” of companies to develop recommendations. I had to intimately understand how the front of the house and back of the house connect and operate. We produce financial results for you, but what we do is not purely about numbers. We don’t manipulate line items in the company financials. Those financials only capture the past. We help you create the future of your business. Your employees are the core of your business. If you’re going to make your business stronger it needs to come from making your employees stronger. Then, they will attract and retain your clients for you. We use our knowledge of how the brain works to get you results. Our capabilities in the psychology and art of how people learn make it easier for your people to see the benefit of change. This motivates them to form more efficient and productive habits that generate customer loyalty. We help you communicate complicated concepts in everyday language. Often, your front line employees and managers have no formal business training. They know the nuts and bolts of your business, but may not have the needed business foundation. We communicate to them how they can contribute to your strategic objectives—in the language they use every day. We have a “deep bench” of consultants that can easily handle your multi-state or international project. Driving Improved Results is part of a larger network of coaches and consultants using similar materials and methodologies. If needed, our company can bring consistency to your multi-location strategic objectives. Now that you know the underlying framework of how we work with clients, please go to the Our Services page to learn about the specific services and programs we offer.